What would the Highlands be without their glorious lochs, which glisten like silver in ever hollow and valley? What pen can depict their beauties? Loch Lomond, where the rocky islets float like swans upon the scintillating water; Loch Maree, nestling neath the strange peaks of Slioch and Ben Eighe; Loch-an-Eilean, lying like a diamond upon the black mantle of encircling pines; savage Loch Einich and Loch Avon, imprisoned by grim precipices, the relics of a far away prehistoric world; the hundreds of small tarns breaking the brown monotony of desolate moorlands and mountain side, or appearing like oases amid sterile wastes of stone and debris, as the beautiful Pools of Dee in the Larig Ghru. Beautiful as are these lochs scenically, they are also extremely beautiful and interesting in themselves. Many of them, especially the smaller tarns, are gardens of beauty wher the pure white chalices of the Water Lily and its golden-hued cousin attract and hold the eye of the passer-by with their sheer loveliness, while the Water Crowfoot, the Water Lobelia and the Bog Trefoil enrich Nature’s delightful garden. Even below the surface are mossy green pastures of Water Milfoil, Hornwort and Pondweeds where the fishes glide amid the snake-like stems. In this chapter, I intend to describe the various floral inhabitants of these delightful stretches of water, and show how marvelously they have been modified to enable them to live in the strange element they have chosen as a home. We shall find that the loch flora can be divided into three clearly defined groups. The first consists of those plants which live entirely in the water with only their flowers or specialized floating leaves above the surface. They include such plants as Water Lilies, Pondweeds, Water Milfoils, Water Crowfoot, etc., which live in fairly deep water. The second consists of those plants that live along the shallow loch shores, usually with their roots below water and the leaves and flowers above. They include such plants as Water Lobelia, Water Plantain and Bog-Ban, which form a fringe of verdure and beauty around the lochs. The third consists of those plants which prefer a moist habitat, but are unable to live with their roots in the water and are found the bank and interstices of loc side rocks beyond the reach of serious inundation. They include such plants as the Mars Willow-herb, Marsh Valerian, etc., which are actually marsh-land plants, and have been described in Chapter XVII. Several plants have become so adapted to watery conditions that they can live submerged below the surface, only sending up flowering shoots in the air. As we have already seen, oxygen s a vital necessity for plants as it is for animals. The oxygen taken in during respiration is used for the oxidation of food substances and the subsequent release of energy provides the necessary stimulus to growth and other vital processes. It may at first appear impossible for plants to respire in water, but we must remember that water contains much dissolved oxygen, which is absorbed by the leaves and stems. No stomata occur on the leaves as these would allow entry of water and would result in the death of the plant, hence the dissolved gas is just absorbed by the epidermal cells. Thus we see that it is possible for plants to respire although submerged and we see that one condition of life is satisfied. But what about the absorption of carbon-dioxide so necessary in the production of sugars and starch by the process of photosynthesis? Here again, owing to the solubility of carbon-dioxide in water, the plant is able to absorb enough for its requirements, and it can also use the carbon-dioxide given out in respiration. The leaves and stems of water plants contain chlorophyll, even in the epidermal cells, and they are thus able to synthesize sugars during daylight, in the same way as land plants do. If we examine the stems, roots or leaves of aquatics under the microscope, we shall find that their tissues consist of large, empty spaces traversed by chains of cells; in fact their tissues are like a sponge, the empty spaces of which are filled with air, or rather oxygen, given off during photosynthesis. The reason for this is, that the roots and the stems are often imbedded in waterlogged mud where no oxygen exists, and, as they are therefore unable to respire, would eventually die. By means of the internal air passages, air is able to reach these buried organs and keep them aerated. The problems faced by aquatic plants are many. The amount of light is less below the surface, and this further decreased by the presence of impurities and of other water plants such as Algae, Duckweed, etc. For this reason chlorophyll occurs in the epidermal layers of the leaves, so that the plant may profit from all the available light. Then again, one must take into account the action of currents, which would tear ordinary leaves to shreds. For this reason most aquatics have tough, leathery leave which are often cut into fine segment which branch out in the direction of the currents and offer little resistance to the their passage. Nearly all aquatics, except Duckweeds and Frog-bit, have their roots in the mud at the bottom of the lochs and obtain nutriment from the soil like ordinary plants. The depth of the water determines the size of the plant, as the aquatic send up long, slender, leafy branches to just below the surface where the light is strongest. Thus many aquatics have stems of great length, often attaining as much as four or five feet. Finally, most aquatics flower above the surface of the water, the branches sending up long peduncles into the air where the flowers open and are cross-pollinated. After fertilization the peduncles often curve downwards, so that the seeds are formed below the water. The origin of the aquatic flora has been much discussed, but opinion inclines towards the theory that aquatic plants have descended from ancestors who were ordinary terrestrial plants. We may look upon them as pioneer colonists, whose ancestors decided to make their homes in the watery medium. They may have done so because of pressure from more virile competitors, who forced them to take to the water in order to survive, in the same way that early colonists forced the native tribes into the inhospitable mountain regions. Or, we may liken them to adventurers pushing out into unknown territory and leaving the safer, more hospitable regions for more timid, less enterprising types. Most families of plants have certain aquatic or water-loving species, but it will be noticed that the more recent families have few or none. Thus the composites, the most numerous and the most modern family, possess very few real aquatics. This shows that the aquatic habit has evolved comparatively late in the life of the family and points to the fact that it is an acquired habit. In Britain we have two principal species, viz., Myriophyllum spicatum and M. verticillatum. They may be found in almost all of our Scottish Highland lochs. The former is a typical under-water aquatic and forms mossy, dark green beds which reach to the surface of the loch. If we examine a bed carefully, we shall find that the individual plants which make it are rooted firmly in the mud at the bottom of the loch. The lower perennial stems creep through the mud, giving out fine rootlets at the nodes, these obtaining all the nitrogen and salts required by the plant. The creeping stem sends up fine branches which ascend almost to the surface and are usually much branched themselves, and are covered in whorls of four or five pinnate leaves composed of six or seven hair-like segments which give a mossy effect to the plants when crowded together in the water. These fine segments present a large aggregate surface to the water, although presenting little opposition to its passage. The leaves absorb the dissolved carbon dioxide from the water and this, with the action of the chlorophyll and sunlight, forms sugars. They also give out oxygen as terrestrial plants do in sunshine, this action also give out oxygen as terrestrial plants do in sunshine, this action being of great biological importance, for as we know, animal life is continually breathing out carbon dioxide, organic acids and bacteria. In the comparatively still waters of ponds and lakes, the gradual solution of carbon dioxide and the continual concentration of bacteria, etc., would make the water unfit for life. Fortunately the plants, by absorbing the carbon dioxide and giving out oxygen, fulfil a dual purpose by clearing the water of excess carbon dioxide and by supplying oxygen which kills harmful bacteria and keeps the water pure and sweet. This beneficial effect is strikingly exhibited in an indoor aquarium which can only be made a success by the introduction of aquatic plants. Each branch of Myriophyllum spicatun is terminated by a slender spike of small green flowers, which gradually lengthens until the little heads of flowers project beyond the surface of the water into the fresh air and the sunshine, where they open and are fertilized. If we examine the flowers we shall find that the lower ones are female and the upper male, but none of them are perfect. The male flowers consist of a small greenish calyx and four minute greenish petals, the stamens having very short filaments with long anthers which project beyond the sepals and petals. When ripe their pollen is distributed by the wind, their position at the top of the flowering stem thus being very advantageous. The female flowers have no petals and are very small with four tiny stigmas. After fertilization each flower forms a very small round capsule which ultimately breaks into four sections, each with a seed inside. These sections are drifted by the currents and gradually becoming waterlogged fall to the bottom to form new plants, perhaps far from their parent. We may sometimes discover in our Scottish lakes the other species of Water Milfoil (Myriophyllum verticillatum). In this species the flowers are found in the axils of the upper leaves and are always immersed in water. Otherwise the plant is difficult to distinguish from M. spicatum. Several species of Pondweed may be found by the enthusiastic botanist in the Highland Lochs, pools, and in the slower streams. Of these a number of species are completely submerged and will be dealt with here, but the species with floating leaves will be described later on. Three of the species have broad, pellucid leaves and form dense masses in the water, whilst the other two have very fine, narrow leave. Of the former we have a fine species in the Shining Pondweed (potamogeton lucens) which inhabits fairly deep, still water, and is more likely to be found in lochs or in deep pools in rivers. It is found in Inverness-shire and most the Highlands to the southward, as well as in Skye and Sutherland. Its stout stems may be as much as six feet in length, whilst the oblong, wavy, brown, pellucid leaves with several green veins may be as much as ten inches in length. In clear water, the leaves may be found almost to the base of the plant, but in turbid water only the upper leaves are fully developed. The stems lengthen until the surface of the water is almost reached. In the axils of the upper leaves, and carefully wrapped up in the transparent stipules, we shall find the flower buds. In summer the stout flower stalks elongate and burst through their membranous cover to rise above the water where the thick cylindrical spike of flowers betrays the presence of the plant. The greenish flowers contain no nectar and are wind pollinated, and thus we see that in spite of its high specialization to aquatic conditions, the plant is still dependent on the open air for the perpetuation of the race. Another fine species, which I found in great luxuriance in a small pond near the boat-of-Garten, in Speyside, is the Long-stalked Pondweed (P. praelongus), which has a similar distribution to P. lucens. It has stout, whitish stems clothed with oblong, sheathing leavs, which are three or four inches in length and rather concave in form. They have a similar texture to those of P. lucens, and their shiny brown surface makes one think of some marine seaweeds. The flowers are produced in large, dense spikes on long thick stalks. A common and well distributed species to be found throughout the Highlands is the Perfoliate Pondweed (P. perfoliatus). It resembles the foregoing, but is rather smaller in all its parts. The oval leaves, which completely embrace the stem, are very thin and transparent and are beautiful objects when seen under the water. The dense spike of flowers is produced on a stout, short stalk. The fine-leaved species are to be found in most parts of the Highlands and inhabit streams as well as still waters. The Small Pondweed (P. pusillus) forms a tangled mass of fine, thread-like stems and narrow, linear leaves of a dull, olive-green colour. It does not form a rhizome and the plants float freely in the water, or are attached by adventitious roots given off from stems. The small spikes only just appear above the surface. During the summer the stems produce green, bud-like objects, which drop to the bottom in the autumn when the stems and leaves die down. The following spring, they sprout and give rise to new stems, leaves and roots. The production of such winter buds is common among aquatics, the advantage to the plant being that the buds pass the winter at the bottom of the water where freezing is rare. A further species, P. filiformis, is a rather similar plant, but the leaves are almost hair-like, and it perennates by means of structures called turions. The two lower internodes of each leafy shoot swell up and become stocked with starch, and in the autumn, when the stems die down, these tubers fall to the bottom of the pond to recommence the species the following year. This remarkable plant is the only European representative of the American family Eriocaulceae, and its only stations in Europe are in Connemara, in western Ireland, and at two places in Scotland, viz., Iona and Dunvegan, Skye. The plant is almost certainly native in these areas and was discovered as long ago as 1764. The Pipewort Family is mainly tropical, but several species are found in North America. How our present plant crossed the Atlantic to Scotland and Ireland is a mystery. It will be noticed, however, that it only occurs in areas in close proximity to the Atlantic. Now very often seeds of plants inhabiting the islands of the Caribbean Sea and the surrounding shores are washed up on the western coasts of Britain by the North Atlantic Drift. Sometimes they germinate, but they rarely establish themselves in our climate; this does not, however, preclude the chance of the survival of adaptable species. Once the seeds arrive on our shores, it would be fairly easy for sea-birds to transport the seeds upon their feet from the seashore to neighboring lakes. The element of chance involved would explain to neighboring lakes. The element of chance involved would explain the scattered distribution of the plant. The Pipewort is not the only American plant to be found wild in Britain, about six species being listed. The best known are the Blue-eyed Grass (Sisyrinchium angustifolium), a member of the Iris Family, and the Orchid, the Irish Lady’s Tresses (Spiranthes Romanzoffiana). In view of the preceding facts it will be seen that the Pipewort is a very interesting plant. Like many aquatic plants, it has a slender rhizome creeping in the mud at the bottom of the lake, the branches having a pipe-like appearance as they consist of long, white, cylindrical sections. One the plant is established, it soon forms large colonies by means of this quick growing, spreading rhizome. From the nodes arise several very narrow leaves, which have the pellucid, soft texture, that we have noticed as characteristic of the underwater leaves of the Pondweeds, although, of course, the Pipewort is not related to them. From the middle of the tuft of radical leaves arises the leafless, erect, flowering stem which may attain as much as two feet in height, and has a six-to eight-angled structure. At its summit is produced a dense head of flowers, which when young is protected by a long sheath, but on growing the stem pushes the flower head out of this sheath. The flower heads are composed of many tiny flowers, the central ones bearing stamens only, whilst the outer ones have pistils only. The flowers are intermixed with tiny chaffy bracts, the outer of which are large and form an involucre which protects the immature flowers before the head opens out. Each flower consists of four perianth segments, the outer two of which are black in colour and fringed at the summit, whilst the inner two are lead-colored with a black spot at the base. In the males the two inner segments are united to form a cup-like perianth containing the four stamens. The females contain a rounded two-chambered ovary, surmounted by two stigmas. The flowers are obviously adapted to insect pollination and are in fact visited by flies who come in search of nectar, and on being disappointed content themselves with the pollen of the central flowers. They usually alight on the outer female flowers and then cross into the males flowers, so that any transported pollen will be left on the female flowers and cross-pollination effected. This is one of the commonest and most widely distributed of the plants which prefer the lochs and tarns for their habitat. It is to be found throughout the whole area of the Highlands and climbs the mountains to 2,000 feet. The plant, which inhabits the shallow shore waters, is usually totally submerged, the possesses a short, perennial stock from the summit of which arise several fleshy, narrow leaves, which are usually two or three inches in length. They possess no stomata and respire like other submerged plants, but if the level of the lake recedes and the plant is partially exposed, the aerial leaves then produce stomata so that respiration and assimilation can continue. The stock gives rise to runners so that in time the plants form mats of leaves and stems beneath the surface. These colonies are so dense that other plants are unable to penetrate them, hence competition is mainly between plants of the same species. The flowers are of two sorts. The males are produced on erect, leafless peduncles, which are each terminated by one or rarely by two flowers, consisting of four narrow, green sepals and a four-lobed, greenish-white, tubular corolla. The four stamens are the most conspicuous part of the flower and possess very long filaments terminated by large, oval, yellow anthers. The females are stalkless and must be carefully searched for among the bases of the leaves. They consist of four narrow, green sepals surrounding a greenish, pear-shaped corolla which is closely applied to the ovary. The flower is remarkable for its long, stiff, erect style, and as it often happens that the lower part of the plant is in water, the need of such a long style becomes apparent. The flowers produce no nectar and are adapted to wind-pollination. One must not think, however, that one has only to visit the lake shore during the flowering season to find the flowers of the Shorewood. Usually it remains submerged and then it does not flower at all, the leaves becoming long and grass-like and the plant depending on vegetative reproduction by means of runners. This is an interesting little plant which may be found in some of the higher Scottish lakes and tarns. I have found it in bleak, wind-swept Loch Etchachan, near the summit of Ben MacDhui, in that wildest of all lakes Loch Avon and in many of the small tarns in the Lochaber Mountains. When one first approaches the shores of Loch Avon, one is astonished by its completely barren, desert-like aspect. Only here and there a patch of green shows that vegetation does exist, but in the main the scene is one of sublime grandeur, of precipitous cliffs and boulder-strewn shores. If we look closer, however, and the season in summer, we may notice a soft green carpet on the gravelly lake bottom. This is the lowly Water Awl-wort, often the only plant to be seen, but in certain places the Water Lobelia bears it company. It is remarkable among the mountain plants in being an annual, the seeds commencing to germinate as soon as the temperature of the water begins to rise in the spring, and this may not be before June in the higher lochs which often have a covering of ice in early May. The whole plant is rarely over three inches in height and in the higher lochs, where the growing period is short, only one or two inches, the very short stem giving rise to a tuft of fine roots which anchor the plant in the gravelly soil. The leaves are all radical and almost cylindrical in form, very slender and pointed, and are completely glabrous, rarely rising above the surface of the water. From the midst of the leaves arises a short, naked stalk or scape which may protrude through the surface into the air, but if the water is deep it remains below the surface. The stalk gives rise to a raceme of small white flowers, the petals of which are very minute. When the flowers are produced above the surface they may be visited by small insects, but as they are very inconspicuous they are usually self-fertilized. When the flowers are unable to reach the surface they perfect themselves under water and do not open. This section of aquatics contains some of our most beautiful native flowers and also some very interesting species. In our Highland lochs we can find the beautiful and chaste White Water Lily, surely the queen of British flowers; its lovely golden cousin the Yellow Water Lily; the Water Crowfoots, of which many varieties abound; the less interesting Bur-reeds and the very common Floating Pondweed. Far away in the depths of the western Highlands, where from the hilltops one can see the inspiring outlines of the Black Coolins against the setting sun, where Rum and Eigg float like galleons on the shimmering Atlantic, there lies, in a peaceful glen, a beautiful tarn, whose mirror-like face reflects back the purple-mantled mountains and the black pines that fringe its further banks. Here, where all is peace and not intruding footsteps break the silence, Nature has had the happy thought to adorn the placid waters with the queenly flowers of the White Water Lily. Here one will find hundreds of great, pure white blossoms floating on the silver loch like fairy ships. Here one can study these beautiful treasures amid scenes untrammeled by man, as the soft south-west wind with its elusive tang of the sea gently ruffles the large, round leaves, breaking up the mirror-like surface of the water into a million scintillating wavelets. 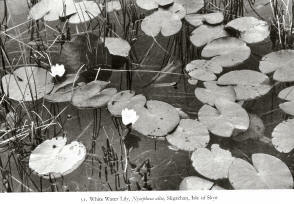 I have often admired the White Water Lily since then, but never under conditions where Nature dwelt in such exquisite surroundings. It is one of the loveliest members of a very beautiful family of which many, including those with flowers of brilliant blues, reds and yellows are cultivated in our ornamental gardens and greenhouses. The gigantic Victoria regia of South America and the sacred Lotus belong to this same delightful family. The Water Lily is a perennial plant with a very thick, fleshy rootstock which is usually buried in the soil at the bottom of the lake. If we examine this rootstock in the springtime, we shall find that near one end there is a large green bud, which is the commencement of the Water Lily plant. The rootstock will be found to be marked at regular intervals with a scar, marking the position of the leaves and flower stalks of other years. Each year the rootstock lengthens, the new portion of the present year giving rise to the new plant next year. As the days length and become warmer, the bud swells and gives rise to several, thick, rubber-like stems surmounted by the leaves which at this stage are curled up tight. The stems continue to grow until they attain the surface of the water, where the leaves open and lie flat. At the same time the flower stem, which was contained among the leaf stalks, reaches the surface, the flower at this time being enclosed in a spherical bud and protected by the smooth, thick, outer sepals. If we cut across one of the stems, we should find that four tubes run along the whole length of them. These tubes are hollow and filled with air which helps to keep the stems buoyant, so that they can support the large leaves and flowers, as well as resist currents. Each leaf is very large, often six to eight inches in diameter, and is almost round except for one side which is deeply heart-shaped. The stem is situated in the middle of the under surface instead of at the base as in most plants. Each leaf lies flat upon the surface of the water, and as the lower surface is in constant contact with the water, no stomata are situated upon it. It is usually reddish in colour below, but of a bright green above and very smooth and highly polished. This is an important feature as any water which may splash upon the supper surface (and this may happen frequently on a windy day) immediately runs off the smooth surface, and does not lie upon t and choke the stomata. The flowers commence to open in June and float upon the surface. They are very large, often as much as four inches in diameter and the petals are dazzlingly white, sometimes fading into rose-pink at the base, and are scentless. This is a reverse of what one would expect, as in the plant world most white flowers are highly perfumed and open in the evening when their scent attracts night-flying insects. The Water Lily, however, open during the day, closing in the early evening, and as its blooms are very conspicuous, it has no need of perfume to attract day-flying insects. If we examine a flower carefully, we shall find that it has four large green sepals, which protect the flower whilst in bud and also at night and in wet weather, when the flower is closed. Within the sepals, we shall find several rows of pure white petals which are glossy and of a fleshy texture. The petals pass gradually into the many rows of stamens, in which the outer stamens have petal-like filaments surmounted by sort anthers, and the inner ones have fine filaments surmounted by long anthers. In the centre of the flower are situated the many carpels which are imbedded in the fleshy receptacle and radiate from the common centre. Each cell is surmounted by short anthers, and the inner ones have fine filaments surmounted by long anthers. In the centre of the flower are situated the many carpels which are imbedded in the fleshy receptacle and radiate from the common centre. Each cell is surmounted by the stigmas which form a ring around the receptacle. These flowers are visited by a host of insects, bees, flies and beetles being the chief benefactors, but many other insects also visit this beautiful flower for pollen and the nectar which is secreted at the base of the petal-like stamens. After the flowers have been pollinated they close and the stems gradually fill with water, the weight of which drags the flower down to the bottom of the pond, where the flower decays and the seeds are released to float along the bottom until they come to rest on the mud to give rise to new plants. Probably no sight in these islands is lovelier than that of a loch or tarn covered with the great green leaves and glorious flowers of this exquisite plant. Happily, the White Water Lily is by no means rare, and one can find many loch and tarns in the Highlands covered by its delightful blooms. This plant is very common in lochs and tarns all over the Highland area, and in many lochs in the Hebrides. It is very handsome and, although lacking the chaste beauty of its white cousin, it can hold its own with most of our commoner plants. Its large, cordate leaves spread out flat upon the surface of the water and, as they are highly polished, any water splashing upon them rolls off. The flowers, which are produced several inches above the surface and are bright yellow in colour, are cup-shaped in form and have five or six large, fleshy, concave sepals which are greenish on the outer surface, and are the advertising agents of the flower. The outer of the twelve to fifteen petals, which are arranged in whorls around the ovary, are rounded, resembling the petals of normal flowers, but the inner ones are small and oblong in form passing gradually into the stamens. The stamens and ovary are very similar to those of the White Water Lily. The flowers, which smell rather strongly, attract hosts of flies, bees and butterflies, and are pollinated as in the case of the preceding. In certain Highland lochs we have yet another water lily, the Least Yellow Water Lily (N. pumila). This plant is much smaller in all its parts, and the stigma has only eight to ten rays compared to fourteen to twenty in the case of the larger plant. This species is a close relative of the Branched Bur-reed (S. erectum), a common plant around the marshy edges of the lochs and streams (see later). The stems are very weak and are rooted in the mud at the bottom of the loch, and as they ascend to the surface of the water, the deeper the loch the longer are stems. From their upper part long, floating, grass-like leaves are given off. The wind-pollinated flowers are produced on aerial stalks, and are arranged in spherical heads, the upper ones consisting entirely of male flowers, the lower two or three being female. Another floating Bur-reed (S. natans), which may be found rarely in deeper waters, is very similar to the preceding, but is large n all its parts and appears to be a variety of the Branched Bur-reed. I have dealt in an earlier chapter with the Insectivorous plants inhabiting the bogs. The present subject is another member of this interesting group of plants, but it prefers lochs, ponds, ditches and marshy pools for its habitat. The Bladderwort is divided into four species, three of which may be found in the Highlands, usually at fairly low altitudes. They are the Common Bladderwort (U. bulgaris); the Lesser Bladderwort (U. minor) and the Intermediate Bladderwort (U. intermedia). A study of these fascinating plants will fill us with astonishment. Their amazing way of life and the intricacy of the mechanism which enable them to lead it, are not equaled anywhere else in the plant world. If we take a plant of the Common Bladderwort out of water, we shall find that no roots attach it to the bottom of the pond and that it is free-floating in the water. It is composed of an intricate mass of slender green branches, which give rise to many bright green leaves, consisting of many finely-cut segments. If a leaf segment is examined under the microscope, it will be seen to be covered with short, tiny, pointed hairs. Let us carefully examine the leaves. We shall see that they are clothed by several bladder-like structures which are rounded in form and are hollow within. To the early botanist these represented air-sacs by which the plant was supported in the water. Their actual function is much amazing than that as they are actually very efficient traps with a very delicate mechanism. They are produced upon short stalks which arise from the main leaf branches. The entrance to the vesicle is a tiny rounded portal, surrounded by fine, branching hairs which stand upright around its edge. What is the function of this strange structure? A very instructive experiment can be arranged as follows. A leaf with two or three vesicles attached is placed in a watch-glass containing a few drops of pond water. This water will probably contain many minute organism call Water Fleas (Daphnieae). Now focus the microscope upon a bladder and watch the entrance carefully. If we are lucky we shall see one of these tiny water fleas approach the entrance to the vesicle. Attracted, perhaps, by it bright green interior, it tries to enter and in so doing will touch the fine hairs, and these immediately drive the water flea into the bladder. At the same time a valve in the entrance shuts like a spring trap effectually imprisoning the little animal. The water flea can be seen swimming around in the bladder, but gradually its movements become slower until it stops and in an hour or two it will be seen to be dead. What is the object of this seemingly wanton destruction? Obviously the plant is not activated by the pleasure of the hunt or by any wish to destroy. We can find the answer to this question by carefully opening a vesicle along its long axis and placing it, with the inner surface uppermost, under the microscope. The walls of the inner surface will then be seen to be covered by four or five branched, star-like hairs, the absorbing organs whose function is to absorb the products of decay given off by the decomposing water flea. Thus we see that the Bladderwort catches these water organisms in order to supplement its food supply. As we have seen, the plant produces no roots and hence cannot obtain salts, such as nitrates, from the soil, but the decaying water fleas supply nitrogen salts to the plant and hence makes up for this deficiency. In the state of Nature little organisms are always being chased by larger ones, and often enter the bladders, thinking to find refuge within their bright green walls. In summer the submerged plant gives rise to stout scape about six to twelve inches high. It is naked except for a few small scales at the base and gives rise to a raceme of four to eight conspicuous, pale yellow flowers. The calyx consists of two ovate, green, similar sepals, one being produced upwards and other one downwards. The corolla s bright yellow or even orange in colour and two-lipped, having a close resemblance to that of the Antirrhinum. The lower lip is very swollen and concave with a prominent palate, the lips being inclined at an angle of forty-five degrees to make a landing stage for bees, and it is produced backwards as a short, conical spur in which the nectarines are hidden. The upper lip is much smaller, half erect and three-lobed and meets the lower lip, the corolla being almost closed. The ovary is a globular structure situated at the base of the corolla and is surmounted by a single style with a bi-lobed stigma situated in the roof of the mouth-like flower. The two stamens are adnate with the corolla, the two anthers being situated in the roof behind the stigma. When a bee alights upon the lower petal, it pushed it proboscis between the lips of the corolla and, on its way down to the spur, it will tough the stigma which immediately folds up. Beyond this the proboscis is dusted with pollen by the anthers. On withdrawing the pollen will not tough the stigma, as it has moved out the way, thus avoiding self-fertilization. After fertilization the ovary forms a rounded capsule containing many small seeds. The plant does not depend on seeds alone for the continuation of the species, for in autumn the stems form large buds, which drop off and remain dormant at the bottom of the pond during the long winter, opening in spring to form new plants. At this time the bladders are full of water and anchor the plant, but as the flowering season approaches the bladders fill with air and the plant becomes buoyant, thus being able to produce its flowers above the surface. The Less Bladderwort differs in being smaller in all its parts and with only one or two bladders to each leaf. The Intermediate Bladderwort is rather different as the bladders are not borne on the leaves, but instead are produced on colorless shoots buried in the mud. The nature of these shoots is rather obscure as they are geotropic, i.e. they grown down into the ground n the same way is roots, but they do not have a root structure. The flowers are bright yellow and nearly as large as those of the Common Bladderwort. This species is rather rare and local in its distribution. One of the commonest and most widely distributed of all aquatic plants is the lovely little Water Crowfoot which we can be fairly sure of finding in running streams, in quiet lochs, in stagnant pools and on damp mud. It assumes many different forms in relation to the varied conditions under which it lives, and hence has been divided into many sub-species and varieties. I will commence my description of this interesting group of plants with the species found in running water. There are two or three supposed varieties of this type, included under the name Ranunculus fluitans. In this plant all the leaves are submerged beneath the water. It is firmly rooted at the bottom of the stream and sends up fairly stout stems, which take up a position parallel to the current, where they offer the least resistance to its passage. The leaves are large and cut up into very fine, hair-like segments which also lie parallel to the current, and are an adaptation to havitat as the current would cut a large entire leaf into ribbons. From the axis of the leaves fairly stout peduncles rise above the surface of the water. The flowers are the only aerial portion of the plant, and the stout peduncles are well able to resist the force of the current and keep the flowers upright in the air. The flowers are pure white in colour and larger than in most varieties of Water Crowfoot. This is probably in order to make them more conspicuous, as smaller flowers would hardly be seen against a background of running, shimmering water. The flower, which possesses a green calyx of five spreading sepals and a corolla of five white obovate petals with a yellow patch at the base of each where the nectar is situated, are visited by the smaller bees and flies, and are pollinated in a similar way to those of the Buttercup (see Chapter XIX). After fertilization the peduncles bend downwards and the seeds are released in the water, which distributes them far from the parent plant. It thus colonizes large areas and may form a mass of vegetation in the centre of the stream, thus slowing the current and causing the deposition of silt. In the quiet waters around the edges of lochs and ponds, we may meet with several other varieties of Water Crowfoot, which all agree in having much divided submerged leaves. These dissected leaves spread out like a fan in the still waters and carry on photosynthesis in the same way the leaves of the completely submerged aquatics, e.g. Myriophyllum. The stems, however, are supported by the floating leaves, which also carry on photosynthesis. The leaves are rounded in form and divided into three to five wedge-shaped segments, or may have five quite rounded segments. In some types, including R. circinatus, the submerged leaves spread out around the stem and on being taken out of the water they do not collapse as in R. fluitans, but remain rigid. In other types there are also floating leaves and here are included R. peltatus and R. heterophyllus. They form dense colonies, as their floating leaves obstruct the light from entering the water, they make if difficult for other plants to thrive in their territory. In winter they sink to the bottom of the loch and are safe from frost and ice. Along the muddy fringes of lochs, ponds, or streams, we may find more types of this ubiquitous plant. They are the Mud Crowfoot (R. Lenormandi) and the Ivy-leaved Crowfoot (R. hederaceus). They are both creeping plants whose weak stems give off adventitious roots at the nodes, and branch in all directions with the result that one plant may cover quite a large area. The leaves, which are on short, erect stalks and are kidney-shaped, with five rounded segments, are smooth, shiny and bright green in colour, and in shallow water they float upon the surface. The flowers are only half-an-inch across in the case of the Mud Crowfoot, whilst in the Ivy-leaved Crowfoot the petals are hardly larger than the sepals. In these plant the flowers are seldom visited by insects, and hence they depend on self-fertilization to obtain seed. Another variety, R. trichophyllous, often to be found upon mud, is an amphibious type and can live either submerged or exposed, its leaves being cut into fine segments, whilst the stems are short and tufted. The flowers are very small and pinkish in colour, and are usually self-fertilized. A study of these plants will give us a good idea of the role played by environment in forming the structure of plants. There is no doubt that all the above plants arose from the same ancestors, but owing to very different conditions of life the various types are evolving away from the parent type to become more and more specialized to a certain type of habitat. Thus R. fluitans could not compete with a still water type and vice-versa. Another aquatic Ranunculus that may be found in wet places, on the edges of lakes and streams, is the Lesser Spearwort (R. Flammula). It possesses long, lanceolate or ovate leaves which are produced above the surface of the water. The flowers are yellow and born upon fairly stout peduncles, and are very similar to those of the Buttercup, but are smaller. This plant has also evolved several varieties, one of which, R. scoticus, grows under water n a few lakes in north-west Scotland, its leaves being reduced to awl-like petioles. Another variety, R. reptans, a slender, creeping plant with linear leaves, may sometimes be found in Scotland. We have already dealt with the submerged Pondweeds in the preceding section of this chapter, and we are now concerned with the type which has floating as well as submerged leaves. The typical example, and the most widespread and common, is the Floating Pondweed (Potamogeton natans). This plant is a fine example of adaptation to aquatic conditions. It has a long, white rhizome, which creeps along the mud at the bottom of the pond, giving off many fibrous roots which anchor it firmly. The rhizomes of many different plants cross over each other and form a dense mass of stems and roots which hold together the mud, leaves and other debris covering the pond bottom. From the rhizome arise the long, slender, pliant, leafy stems which grow up to the surface of the water, supported by the air which collect in the spongy tissue of the stem. At the nodes the under-water stem often gives rise to thin, brown, pellucid, narrow leaves which remain submerged and absorb carbon-dioxide and oxygen from the water, and until the floating leaves are produced, the plant is dependent on this source. When the stem reaches the surface, the upper leaves, which have been carefully rolled up inside cylindrical, transparent sheaths, break out of their prison and, supported on long stalks, they open out and float on the surface of the water. They are leathery and elliptical in form with dark green, polished upper surface on which the stomata are developed. The under surface is brownish with a thick impermeable cuticle. These leaves provide the plant with by far the greater portion of its oxygen and carbon-dioxide. The stems often reach three or four feet in length, depending on the depth of the water. Once the floating leaves are fully developed, a stout cylindrical flowerstalk appears from a tubular sheath in the axil of one of the floating leaves. It is terminated by a long spike of green flowers. The flowers consist of four tiny green perianth segments surrounding four sessile green carpels. Opposite the join between each carpel is a stalkless stamen. The absence of colour and perfume shows that the flowers do not depend on insects for pollination, but they are in fact wind-pollinated. If we visit a colony in summer, we shall see that the surface of the water has a yellow tinge from the abundant pollen which has been blown from the stamens. This gives point to the fact that wind-pollination is a wasteful way of obtaining fertilization, as enormous quantities of pollen never reach the pistils of other spikes. A similar species, P. heterophyllus, is also a common and well distributed plant, but it prefers the more acid types of lochs and pools. The floating leaves are much smaller, being only one or two inches in length, whilst the submerged leaves are very long and narrow with a few parallel veins. Sometimes no floating leaves are formed and it is then distinguished with difficulty from submerged leaved species. P. alpines is closely related to P. lucens (see page 221), but it has shortly-stalked, reddish, floating leaves which in shallow water may even become erect. In deep water narrow, stalkless, submerged leaves are also formed. This species is found in most of the Highland area south of the Caledonian Canal and in the South Hebrides.